I love traveling. I have been to Austria, Italy, France, the Czech Republic and many other European countries, but as it happens I have hardly left Bristol since living here. I have gone as far as Cardiff to the West, London to the East and I think Bridgwater to the South. I haven’t gone any further than Almondsbury when it comes to making it “Up North” and Almondsbury can still be counted as “Greater Bristol”, if you ask me. It’s quite pathetic really, so this year I want to make an effort and explore the UK with my little family and what better chance is there thanusing the Easter break at the end of March for a bit of UK traveling? 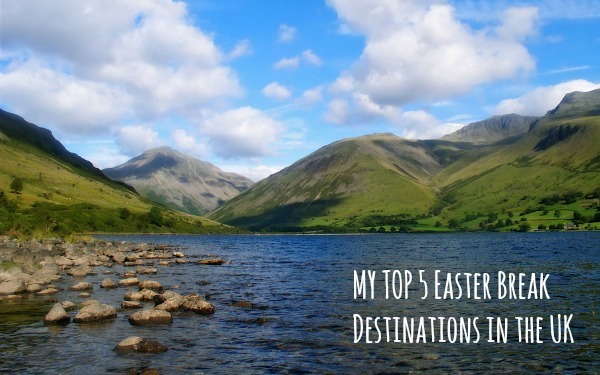 So over the last couple of days, I have been doing a bit of research and I have come up with my top 5 Easter break destinations in the UK. I love Cornwall’s picture perfect coastline and its cute little fisher villages and all the attractions that keep young and old entertained no matter if it’s raining cats and dogs or if the sun is shining. It’s not too far away from Bristol either, so we wouldn’t spend 8 hours in the car getting there. I would love to spend a day at Eden Project, watch the sea lions on Great Western Beach and dine at Jamie Oliver’s restaurant “Fifteen”, Ben would love me forever, if we went there and he would actually meet Jamie himself. He’s a massive fan! I have wanted to visit the Lake District ever since we learned about it at school. The kids that starred in our English book took a trip to Lake Windermere and we learned how to write postcards with them – exciting times when you are 12 years old and learning English! Funny enough, I would love to do exactly what Kevin & Co got up to in my English book. They stayed in a cute little cottage, I don’t know if it was one from Cumbrian-Cottages.co.uk, went on long walks, enjoyed the great outdoors and had yummy picnics. It just sounded so idyllic back then, that I’ve already had a look for Easter breaks there, but shhh don’t tell Ben. I might just try and win a Easter holiday with Cumbrian-Cottages.co.uk next week, so that he can’t complain! I don’t really know why I want to go to Oxford other than wanting to see THE university of universities, but I guess it’s a little bit like going to Boston and just having to go and have a stroll around Harvard campus. Oxford is just too famous to give it a miss, so I’d spend my day searching for Christ Church college, where parts of Harry Potter were filmed and enjoy a bit of punting on the River Cherwell. My friend Aline went there a couple of years ago and she’s still talking about her punting adventure now, so it’sreally on top of my “things to do in Oxford list” – just like buying a university of Oxford jumper, so you I walk around the streets in it and make everyone’s jaw drop – that’s the effect those jumpers have on me, I don’t know if you find them just as exciting!? It might be just me, but whenever I think about the British seaside, it’s always Brighton that springs to my mind. To me it’s just the epitome of seaside fun, so it shouldn’t be a surprise to you that Brighton made it into my Top 5 Easter break destinations in the UK. I’d love to walk along the pier and enjoy all the rides and arcade games. We don’t have anything like it in Germany and it just makes a day at the seaside sound so much more fun. Of course, I wouldn’t go home without taking silly photos in traditional swimming costumes and feeling like a child eating candy floss and ice-cream – that’s a seaside must! As I also do love a bit of culture, I would definitely make sure that I stay long enough visit the Royal Pavilion and see a comedy show in the evening – Brighton is Britain’s comedic capital after all! I don’t know why, but when I think of Norfolk, I think of colourful beach huts, artist colonies and peaceful corn fields swaying in the wind. Norfolk is the one region that I always connect with the stereotypical image of the English countryside, but it has so much more to offer, both culturally and for family entertainment. Oh yes and you can go glamping in Norfolk– I’ve always wanted to do that because it looks so much fun and if I say glamping quickly enough, people might actually think I said camping, which then would make them think that I have overcome my fear of being away from running water and electricity for longer than 3 hours. They’d be so proud of me! Disclosure: This post was brought to you in association with Cumbrian Cottages.